I find this interesting for a number of reasons. First, if we look at the history of Stanley planes in general, we find that after World War II, their quality and availability has suffered (in my opinion). The manufacturing was outsourced overseas and the fit and finish of the machining was and is pretty rough. 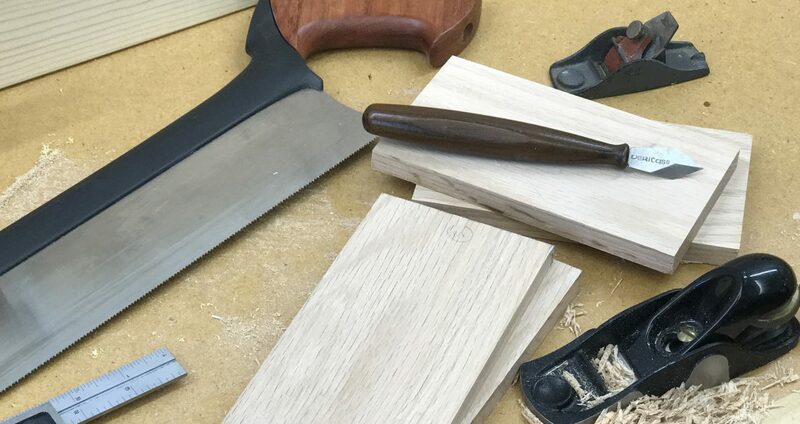 In the woodworking sector, and for the serious hobbyists and professionals, quality hand planes are as much a part of the wood shop as a table saw and electric router. At least they should be. But you need good ones. The problem was that unless you could find a good, used pre-WWII Stanley or Bailey hand plane, you had to settle for poorly-made imports. Thomas Lie-Nielsen and Veritas stepped up to the plate many years ago to manufacture high-quality planes that rival the best Stanley ever made and will last for generations. More recently, Stanley introduced a “new” line of hand planes. It almost seemed as if someone in marketing suddenly realized they were missing out on the woodworking market. They tried to capitalize on the “Sweetheart” name known by collectors of old Stanley/Bailey planes. Stanley’s redesigned planes have a more modern look. The problem is, they still suffer from the same quality-of-manufacturing issues they’ve had for the last 40 years. I’ve had them in my hands and was not impressed. Well, perhaps the folks at Stanley Black & Decker recognize that they need to come out with something new/better/different if they want to compete with the likes of Lie-Nielsen and Veritas. So let’s analyze these patents and see what they’ve got up their sleeves. The present invention provides a plane with an improved construction for enabling longitudinal and lateral adjustment of the plane blade. At first glance of the patent drawings, it appears that they’re using a design similar to the Norris-style lateral adjustment that Veritas now uses. Nothing revolutionary there. I happen to like that style of adjuster. 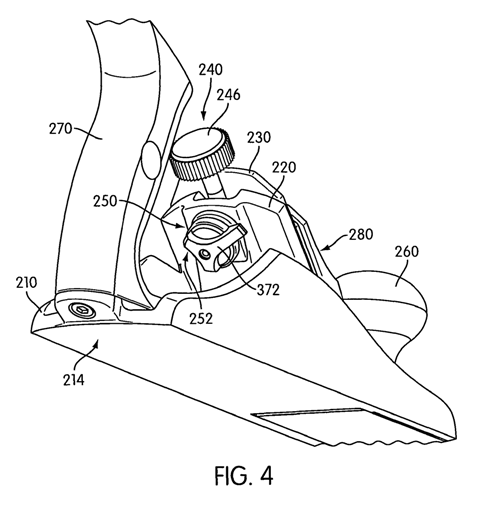 But these patents appear to be addressing another issue. If you look at the drawing on the right, you’ll see a curious little knob on the back side of the frog. The pivot bushing for the lateral adjustment is threaded and protrudes through the back of the frog. This is unlike the Norris-style adjusters where the pivot pushing simply rests in a counterbored recess on the front face of the frog. The knob (372) shown in the Stanley patent drawing engages the threaded bushing and is used to apply friction to the lateral movement of the adjuster/blade assembly without affecting the ability to adjust the depth of the blade. I can’t decide if this is a worthwhile feature or not. I suppose there have been times when I’ve accidentally knocked the blade out of alignment. And I have a few old planes that have some difficulty maintaining their adjustment. The problem is, if you tighten the screw that holds the lever cap in place to apply more pressure to the blade, you also restrict the ability to adjust the depth. So perhaps there is some merit to this patent. With the knob in the Stanley patent, you can torque it down enough to prevent any lateral movement of the blade. In other words, the tighter the knob, the more friction you apply to the lateral adjuster. What’s unclear to me is how this still allows depth adjustment. The cross-section views of the patent drawings are a little difficult for me to decipher. The relevant text portions explaining the mechanism are buried about halfway into the document. If you’re a glutton for technical jargon, I encourage you to read the patents. Otherwise, we’ll have to wait and see if Stanley incorporates this feature into their planes. Let’s hope they work on improving the quality, fit, and finish of the rest of the plane while they’re at it. Posted on September 6, 2013 September 5, 2013 by Randy MaxeyPosted in Hand Planes, Hand Tools, WoodworkingTagged Hand Planes, Tools, Woodworking.